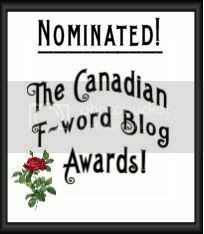 Best Canadian Feminist Blog Best Entertainment Blog Best Group Blog The Support Bro: Best support by a male The first round of voting continues today and tomorrow, so please swing on over and lend us your support. While you’re there, check out some of the other amazing sites that have been nominated. UPDATE: Sorry, I missed Wesley’s category earlier. He snagged two nominations for this award, congrats, Wesley!